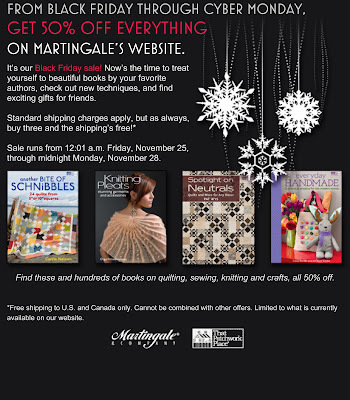 There are a few Black Friday sales related to quilting that I just had to pass on. They are offering 50% off all books and free shipping. I can tell you right now I have about 5 titles I am getting. You know because I need so many new books! Black Friday Blowout: Over 200 items 30-50% OFF for 3 days only! 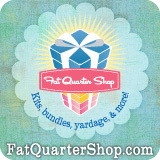 Cyber Monday Sale: 25% off any order – 4 days only! Use coupon code: monday11. Offer expires at Midnight CST, Thursday, Dec 1st. Terms: Coupon must be used online and can only be used once. Discount is not combinable with any other offer and is not applicable to clubs, programs or the purchase of gift certificates. Not applicable to previous orders. 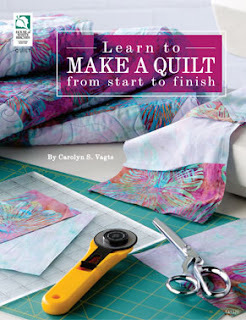 Unsure of what to purchase at accuquilt.com? Get the quilter in your life the gift of choice with AccuQuilt’s eGift Cards. I'm almost not sure where to begin this post. As many of you know I had surgery last week. It is thankfully my last this year and for quite some time if I can manage it. I guess we are never sure if our health will hold out but I am hedging my bets in a positive direction. Part of the specialness of this last week was that my mom came to stay with us. She can rarely take any time off of her job as a hair dresser so this was even more special. There were some ups and downs and now I am on the mend but the leg still lets me know every 4 hours that it's still there! My mom went home yesterday. That was tough because we miss her. Today is not like any other wednesday. I was planning a stay it home day. That quickly changed when I realized that my 10 year old had a doctors appt. (since they are off school for Thanksgiving). Hubby is working so my broken self was elected to take her. there was a package at my door. It was from Joyce from J'Ellens. Did I order and not remember? no I didn't order. I'm sure I didn't. Joyce and Katrina sent me treats to help me feel better. robin egg blue, porcelain and slate grey. I almost instantly started crying from happiness that they were so thoughtful. I don't deserve to have such great friends. I can't wait to see them and thank them in person. You made my day, week and month. I have the Christmas song "Hark the Herald Angels Sing" floating in my mind. There may be something seriously wrong with me. I made some bindings so that I can sew them onto quilts this weekend and prepare hand work to do while I am off the next 2 weeks. Actually, I am off work for 11 days. I am having surgery again. This is the last one this year....I hope. At any rate, I am preparing handwork and english paper piecing to keep me busy. My mom is coming too which should be a BIG help. so January, February and March can't come soon enough. Ah yes the borders are on and it's ready for quilting. That's the next challenge...hand quilt? machine quilt? Well I did hand piece the flowers so I think I am going to hand quilt it. That could take awhile but atleast the top is done! I didn't really intend to be 'away' from my blog this long. I am going to try to be better. I just didn't want to post without pictures. but I don't think Marie Callenders count as "my pie recipe". So I decided not to post it LOL. I am going to make some more pictures this weekend, it's a beautiful weekend for it.